Soon the submarine was searching again-this time for survivors of other downed aircraft who had been reported by circling planes to be floating on rafts in Tigrone's lifeguard area. Night fell before the submarine located the rafts; but, early on the 30th, she surfaced and, despite 30-foot waves, resumed the search. Friendly aircraft aided her efforts, and Tigrone's persistence was rewarded when she at last located seven Army aviators afloat on a raft. These tenacious survivors had been washed overboard several times during the night but had climbed back each time. The heavy seas made rescue difficult and time-consuming, but finally the exhausted aviators were brought safely on board the submarine. Tigrone jauntily sent out the message, "Tigrone has saved the air force and is now returning to Iwo Jima with 28 rescued zoomies," and noted that she had set a new record for lifeguard proficiency. 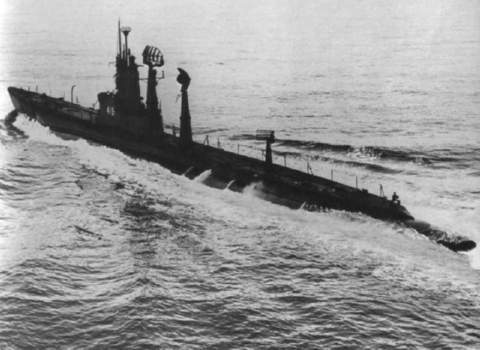 On 5 May, she began pre-inactiyation procedures and, on 27 June 1975, was decommissioned at the Naval Submarine Base, Groton, Conn. At the time of her decommissioning, Tigrone was the oldest submarine in commission in the United States Navy, as well as the last unit of the submarine force still in operation to have taken part in combat action in World War II. Her name was struck from the Navy list on that same day, and she was sunk as a target on 25 October 1976.